Quinoa is technically a seed, but it is treated like a grain in cooking. Be sure to rinse quinoa thoroughly prior to cooking to remove the bitter resin-like coating called saponin. Combine the rice milk and quinoa in a medium saucepan. Bring to a gentle simmer. Cover and cook for about 15 minutes, until the quinoa is tender. Stir in the apricots, raisins, and vanilla extract. Cover and cook for 2 minutes longer. Serve warm or chilled. Stored in a covered container in the refrigerator, leftover Fruited Breakfast Quinoa will keep for up to 3 days. 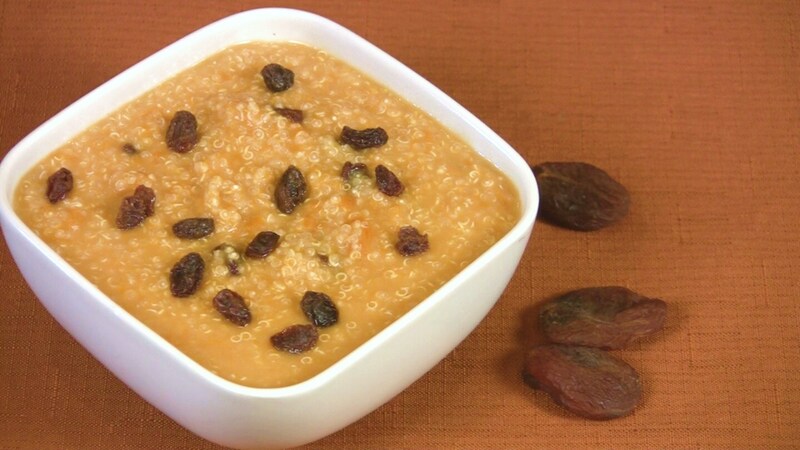 *Reconstitute dried apricots in about a cup of hot water and let them sit until plump.